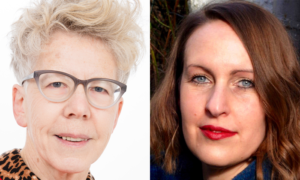 Kendal Library host a reading from two Cumbrian poets, Polly Atkin and Kate Davis. Polly’s collection Basic Nest Architecture (Seren, 2017) weaves together poems which explore both the natural landscape and the landscape of the body and the impact of illness. Kate’s first collection The Girl Who Forgot How To Walk was published by Penned In The Margins in 2018. It tells the story of a small child who falls into the sea and explores disability across a shifting landscape.